At sunset, the bright yellow colors span the sky and highlight the landscape of the Frenchman River Valley in the West Block of Grasslands National Park in Saskatchewan, Canada. 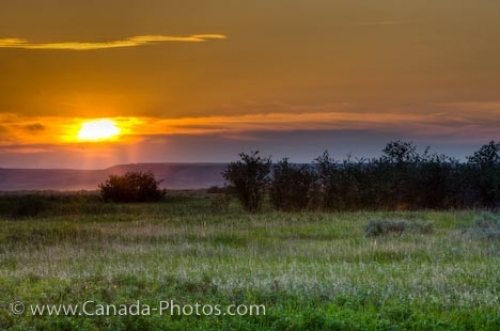 Across the prairie landscape of the Frenchman River Valley in the West Block of Grasslands National Park in Saskatchewan, the rolling hills adorn the backdrop where the vibrant colors at sunset fill the sky. The clouds have moved in blocking the full of effect of the sunset, but the sun manages to filter through them. Grasslands National Park is a highly concentrated area where the focus is to keep the preservation of the plant life and the wildlife, some of which has been non-existent for years. To experience this land of rolling hills, coulees and sunsets, self-guided driving tours are a favorite by most visitors while others prefer to hike across the West Block and explore the park. Picture of a sunset settling in over the hills in the West Block of Grasslands National Park in Saskatchewan, Canada.